Figure 1: Location of the TGS Atlantic Margin 3D seismic project in the Norwegian Sea. By the end of 2018 TGS will have acquired a total of 45,000 km2 of high resolution 3D seismic across the Møre and Vøring Basins in the Norwegian Sea. 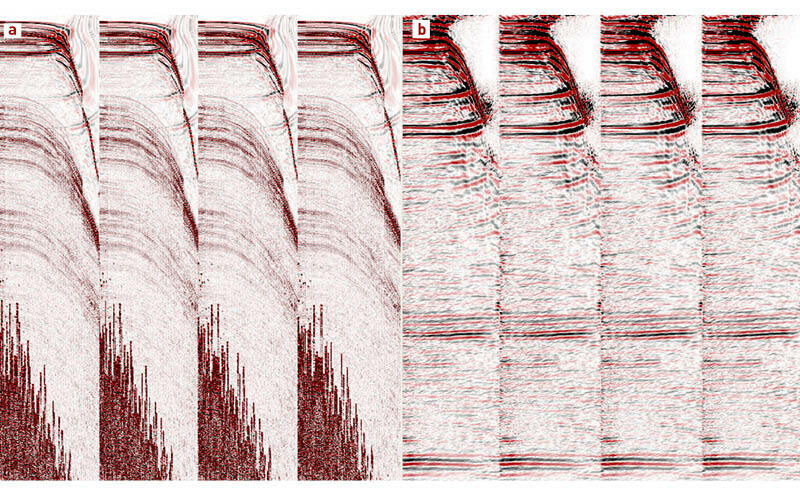 This article summarises how the project has utilised the triple-source seismic acquisition technique, and how successful deblending technology ensures that these data can be used to explore shallow gas targets and image below the volcanic facies and the deeper Jurassic pre-rift structures. Consequently, new play concepts and ideas regarding prospectivity are being considered. The Atlantic Margin (AM17) 3D seismic project in the Norwegian Sea covers vast deepwater areas off the coast of mid Norway (Figure 1). The area is still immature, with just a few wells targeting big dome structures created by Tertiary inversion. Figure 2: Top Eocene horizon across the Atlantic Margin North 3D in the Southern Vøring Basin. Structural highs are represented in red. The Møre and Southern Vøring Basins are challenging seismic terrains that include soft sediment deformation in the overburden, shallow gas, Holocene to Pleistocene seafloor slides, a volcanic sill intruded Cretaceous basin and sub-basalt targets within the Møre Marginal High. Figure 3 is from the Southern Møre Basin and shows some of the challenges that the region presents. In the centre we see two types of soft sediment deformations: to the left a low relief mud diapir and to the right a terrain of possible sand injectites. Both diapir types are often triggered by gas. The sill intrusions in the Cretaceous below have created migration paths and structural closures by altering the rhyology (stiffness) of the basin, and might have also intruded though a source rock. We observe many deep sills within the Blålange Formation, classified as a good marine source rock in the Helland Hansen well (6505/10-1). There are clear seismic imaging challenges with regard to volcanic sills and the side effects of these in data processing, but they also create positive effects like structural traps in an almost flat basin floor, aiding migration and even generating hydrocarbons. The seismic line below was featured as a foldout in Vol. 15, No. 3 in June 2018. It shows a fast track PSTM seismic profile through the Southern Møre Basin, North Atlantic Margin. Data acquired by TGS. Figure 3: Fast track PSTM seismic profile through the Southern Møre Basin. Figure 2 shows the Top Eocene horizon picked in the AM17 dataset in the Southern Vøring Basin. The Helland Hansen two-part dome is seen to the right (east), before the line passes the ‘Middle Dome’ and into the rugged surface where hydrothermal vent systems and shallow sill intrusions create numerous structural closures in the west. A new play consisting of three-way closure and cross-cutting gas hydrates in the west, trapping free gas in Miocene beds over a vast area, is seen at the top of the seismic line. With Norwegian gas production in decline and the European gas market expanding, the Møre and Vøring Basins in the Norwegian Sea represent great places to explore for new gas prospects. 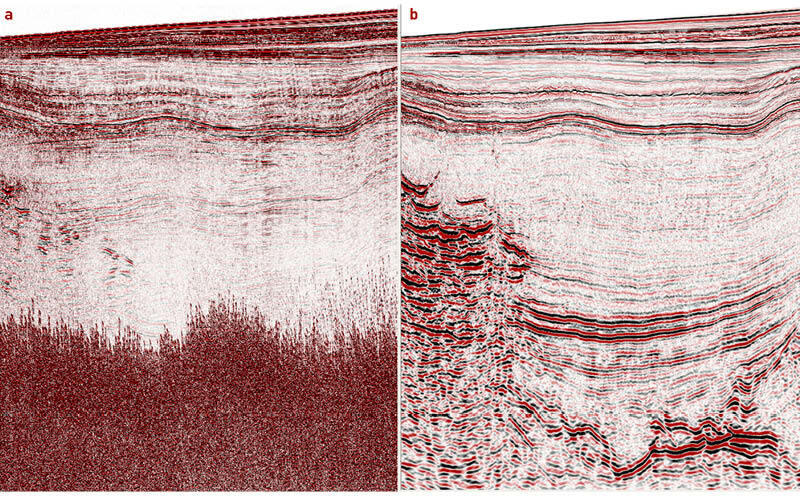 Figure 4: A seismic profile through the Atlantic Margin 3D: (a) before deblending; (b) after fast track PSTM. In 2017 TGS commenced the largest 3D seismic campaign in Europe. Known as the Atlantic Margin 3D, this project in the Norwegian Sea covers a region which is immature with regard to exploration drilling, although it is reasonably close to existing infrastructure. The technical drilling successes in the region so far have found oil and gas in Upper Cretaceous and Palaeocene units. The Ellida and Havsule wells indicate an active oil source is present in the Møre Basin, but the common expectation is gas. The Ormen Lange field, discovered in 1997, produces 20% of the natural gas consumption of the UK market. Recent gas prices in Norway have reached record highs, and interest in gas is rising. To date, 34,000 km2 of 3D seismic have been acquired, with a further 11,000 km2 to be shot during the summer of 2018. The area offers a range of challenges to be tackled in data processing. In the west there are flow basalts and volcanoclastic deltas, with volcanic sills intruding into the main basin, while the eastern part exhibits soft sediment deformations, mud diapirs and sand injectites with many gas anomalies. To address these challenges, it was considered important to provide the industry with a high-resolution dataset that can correctly image the shallower gas targets, whilst also preserving lower seismic frequencies to image below the volcanic facies and the deeper Jurassic pre-rift structures. Figure 5: Example CMP gathers from the Atlantic Margin 3D: (a) before deblending; (b) after fast track PSTM. To realise the goal of efficient, high resolution acquisition, a triple source configuration was implemented. By going from two to three sources, vessels can support a larger total cable spread and still maintain the same crossline subsurface bin size. The cable spacing for this survey was 112.5m at the near offsets, which gives a crossline bin size of 18.75m when three sources are used. Further acquisition efficiencies were achieved by using multiple vessels, with up to four acquiring data simultaneously. In order to maintain CMP fold, the shot interval between each one of the three sources being activated was reduced to 12.5m. 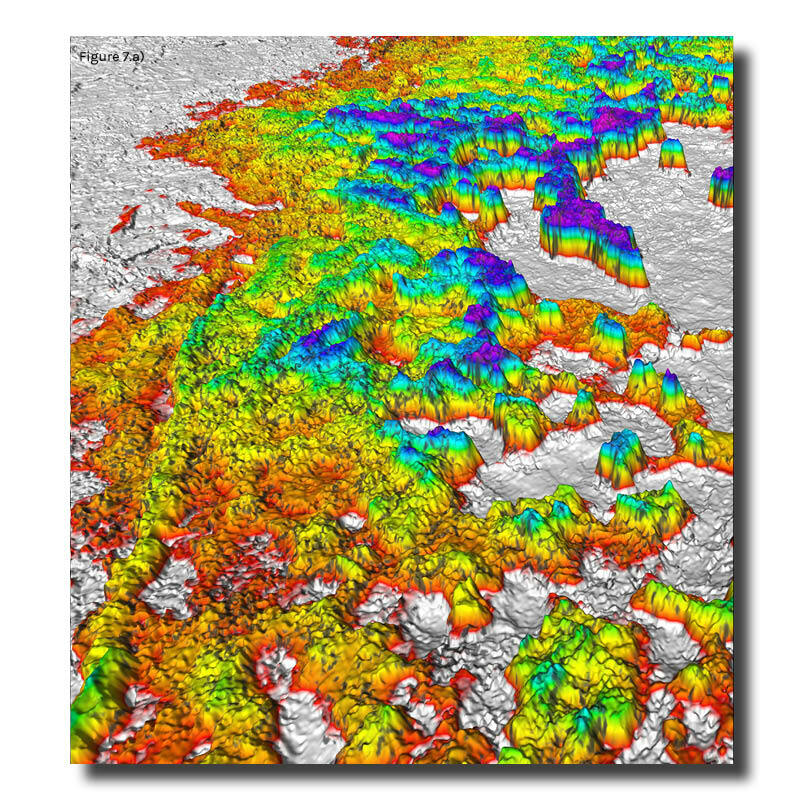 This acquisition design yields a high density, high fold 3D seismic dataset, well suited to creating high resolution images of shallow gas-related targets. The 12.5m shot interval, combined with an average boat speed of 4.5 knots, means that a significant portion of each shot record is blended with – that is, overlain by – data from the previous or subsequent shots, setting up one of the key signal processing challenges of the project. There are approximately 5.3s of ‘clean’ record before the subsequent shot arrives. In this interval the data that we wish to image has decayed to be as much as 40–50 dB weaker than the energy that overlays it. A combination of natural and random time dithers was also used to make the overlapping energy random in certain domains. To deblend the data TGS has developed a multi-domain coherency-based separation technique. The first is a local weighted stack to remove the direct arrivals of the overlying shot. The key deblending step is the second one, in which a unique High Resolution Moveout Transform (Masoomzadeh and Hardwick, 2012) is used to build a model of the overlaying shot energy in the 2D CMP domain. The last step is a pass of multi-domain noise attenuation to address any residual energy from the overlying shot. Figures 4 and 5 demonstrate that data previously overlain by blended energy has been successfully recovered, revealing deep structures. 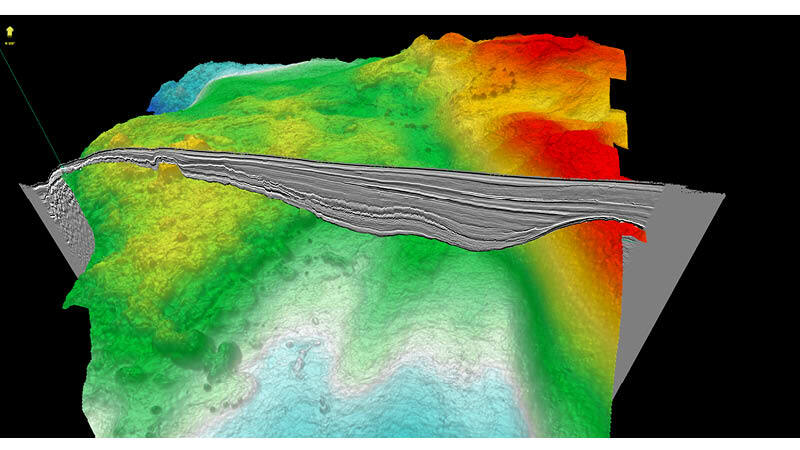 Figure 6: 3D seismic profile through the western Møre Basin. A stacked intra-basalt lead is highlighted. The area covered by the new 3D has water depths from 500 to 2,500m and the deep sedimentary Møre and southern Vøring Basins are filled with thick Cretaceous and Cenozoic successions. The dominant sedimentation process in the area is gravity flow deposits (turbidites). From the Cretaceous to Palaeocene these turbidite reservoirs were sourced from both the Greenland and Norwegian side. There are numerous leads in this proven play and now with the modern high-resolution 3D data the opportunity arises to evaluate intra-basalt leads (Figure 6). Figure 7.a) Interpretation of the sand thickness mapped across potential sand injectites. 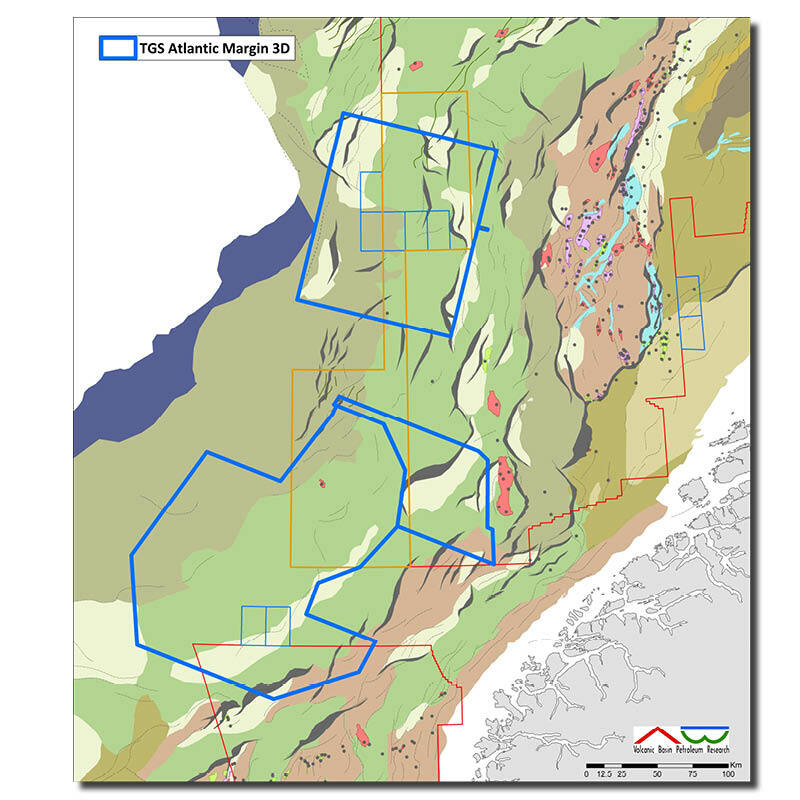 An extension to the original Atlantic Margin 3D programme, supported by industry funding, will provide new 3D seismic close to and west of the Ormen Lange gas field. The main reservoir in this field comes from Palaeocene turbidites sourced from Norway. Over the Vigra High, 50 km west of Ormen Lange, we observe large thickness variations in the Palaeocene interval. AVO anomalies (class 3 trends) surround the deeper high in a doughnut shape. Several bright amplitude anomalies are also seen near Ormen Lange in the slope down and westward, suggesting stratified traps at a tie-back distance from the gas field. Similar observations are made surrounding the drilled prospects Havsule, Solsikke and Edvarda – all drilled on top of the inverted domes and pronounced dry. It is a quite striking correlation that none of these wells have apparent brightening in any levels. From this we conclude that subtle highs existed already in the Late Cretaceous and Palaeocene, and not only in the Miocene (the main period for inversion), acting as barriers and controlling the turbidite fan systems. We suggest future drilling programmes should focus on the flanks of these domes. Figure 7.b) Interpretation of the sand thickness mapped across potential sand injectites. 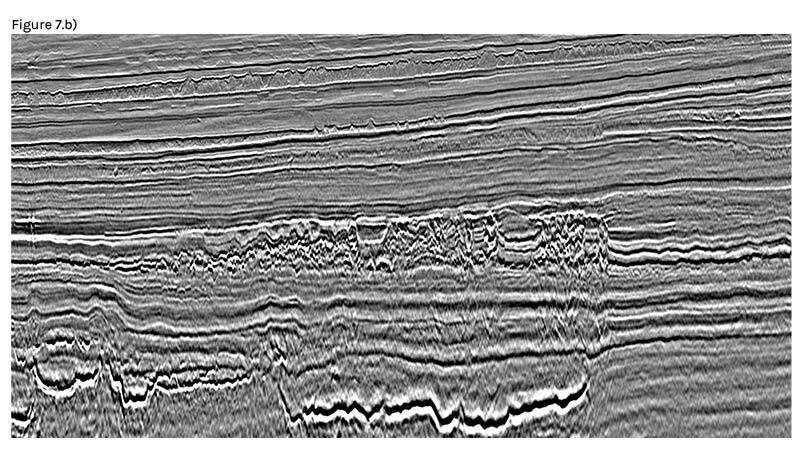 Within the slope down from the Tampen area in the North Sea we observe large elongated mounds with a chaotic interior. Utilising the fast track PSTM data from the Atlantic Margin 3D data, we strongly believe we are looking at sand injectites of Eocene age. Gas is normally involved when we get injectites like this: our hypothesis is that gas and rapid loading from the Plio-Pleistocene created overpressure, simultaneously triggering the sand injectites and filling the stratified traps. An Eocene deltaic sand sourced from the Tampen area is likely to represent the mother bed. In summary, improved imaging, resulting from triple-source acquisition and the subsequent deblending technology, is contributing to a much greater understanding of this underexplored region and can help to realise the full potential of this area of the Norwegian Continental Shelf. Masoomzadeh, H., and Hardwick, A.  High-resolution moveout transform; a robust technique for modeling stackable seismic events. 82nd Annual International Meeting, SEG, Expanded Abstracts.